Quite a few people from the community groups Lockyer Community Action Inc. and Lockyer Uplands Catchments Inc. went to the consultation meeting on the draft SEQ Regional Plan last month. The first surprise was that there was not to be any presentation about the background, objectives, structure or process leading up to the production of the draft. Instead, the public were to be provided with “consultations” with individual planners. A novel idea, but it would have been much more useful had we been provided with an overview of the draft from the planner responsible for preparing the document. The second surprise came when we were led into the meeting room and introduced to a planner by one of the “ushers” who had been issuing numbers to the public in the foyer – she told us that we had a limit of 10 minutes with the planner. Despite the planner my partner and I were paired up with doing her best, many of our questions were outside of her field of involvement in the preparation of the draft plan, so we didn’t really get satisfactory answers to our questions and certainly did not have a usefully informative discussion on the topics of concern to us. The others in our group came away from their meetings with very similar feelings. It was with some delight that I came across the article below in today’s issue of The Conversation – it pretty much sums up my misgivings about the consultation process, the preparation of the plan, and the general thrust of its content. Overall, the issues below are illustrative of my general impression from a number of exchanges with different arms of the State government in the last year that we are not being well served by this government, and that their priorities are much more aligned with those of developers and industry. Special interest groups have had much more influence than the wider community on the new regional plan for Southeast Queensland. 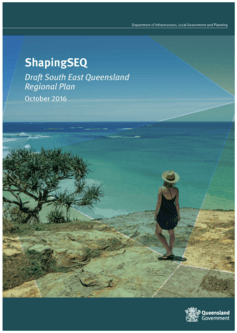 A draft of the plan, ShapingSEQ, was recently released for comment. Prior input from the wider community was limited to submitting “thought bubbles” about the region without having the benefit of any report card on how the previous plan had performed. This process did not accurately gauge community concerns and submitters were not a representative sample. Perhaps it gave people the feeling they’d “had a say”. The process just as likely reinforced cynicism about government consultation. Regional planning in Southeast Queensland began in the early 1990s when councils in the region signed up to the Regional Framework for Growth Management. This was a non-binding set of guidelines promoted by the state government to manage land-use change. Subsequently, this framework evolved into a statutory regional plan in 2005. It is noteworthy that consultation in the lead-up to the 2005 plan included the public release of discussion papers with options for the region’s future. The initial focus was very much on getting southeast Queensland councils to accept the need for regional planning. At that time, the role of the wider community was relatively minor. A 1990 meeting of representatives from government, business, trade unions, professional groups and community organisations was an important impetus for starting the regional planning process. This “stakeholder” model of community engagement has been the dominant form of consultation ever since. Stakeholders have particular vested interests – such as protecting the environment, promoting a business sector, or advancing a government agency’s agenda. Preparation of the 2016 draft plan involved several of these stakeholder “reference groups”. Participants in these groups were there to advocate for the organisation they represent, often making it more difficult to find “outside-the-box” solutions. Consultation by negotiating with stakeholders is consistent with the dominant view that explicitly pursuing the public interest is less important than growing the economy. Consequently, an “issue management” approach has been taken, with stakeholders “competing” for influence over which development regulations are put in place. Within this worldview, trade-offs between stakeholders usually take place in a “growth first” framework. An alternative is to promote informed deliberation by citizens who don’t represent particular interests. The Perth Dialogue with the City process shows how this “citizen” approach can work. This was a process of engagement with a large group of demographically representative Perth citizens. They were provided with relevant in-depth information before their deliberations about the city’s future. It has been at least ten years since there was either an open performance review of southeast Queensland regional planning, or consultation with the wider community on options for the region’s future. Engagement with the wider community is particularly important now for a couple of reasons. First, the 2016 draft plan claims to have a 50-year vision horizon, compared to the previous plan’s 20 years. Because of this change, the wider community should have been engaged in developing this new vision rather than being presented with a fait accompli in the draft plan. The ShapingSEQ draft plan seems to have more of a ‘growth first’ approach than the 2009 regional plan. Second, the draft plan represents a significant change of focus from the previous 2009 plan. That plan aimed to reduce the region’s ecological footprint and mitigate climate change by reducing greenhouse gas emissions. In contrast, the 2016 draft seems to be adopting a more “growth first” approach. It is noteworthy that virtually all references to climate change in this new draft are about adapting to change rather than reducing greenhouse gas emissions. These significant changes should have been widely debated before the draft plan was prepared. For a debate on future directions to be genuine, the community needs an independent, comprehensive report card on how things are tracking. The draft plan has ten indicators, some of which show modest improvement. However, other indicators, such as housing affordability and loss of biodiversity, have gone backwards. And koala numbers continue to decline. The report card should also acknowledge that Australia (including southeast Queensland) has one of the worst records for resource use and greenhouse gas emissions per unit of economic output of any developed country. The draft plan largely takes a basic “provide land for the predicted demand” approach, which assumes that regional planning is a type of technical process best left to the experts. However, regional planning always involves trade-offs between different economic, social and environmental values. These should be openly discussed through genuine community engagement. By not providing opportunities for such engagement, the draft plan has failed to give the community a real say in the region’s future. ShapingSEQ is open for community feedback by formal submission until midnight, Friday, March 3 2017. This entry was posted in governance, Lockyer Valley, LVRC, resilience, sustainable lifestyle. Bookmark the permalink. Having some experience with government bodies, it’s no surprise to me that avoidance of accountability, was the process adopted. It’s how the most unfettered harm gets done, in the name of growth. Nothing else matters than making the most money. Hi Chris. Yes, I agree about the avoidance of accountability as a description of the public consultation process. However in terms of the factors driving the overt and covert policies represented in the draft SEQ Regional Plan I think that there are more powerful forces at play. The creation (or non-hindrance) of wealth creation opportunities for “mates” and supporters has to be way up there.